Domi is one of the few girls I shoot with that was an established model before we started shooting together. A Texas girl living in Atlanta making a name for herself shooting with a lot of talented artists. This was to be our 4th time shooting together, and final time shooting together before she moved back to Austin for school. The thing about shooting with women that shoot with other photographers, and women I shoot with often, is I can’t do the same things I do usually. I have to put way more thought into our shoots, and step outside of my comfort area. Today was no different. I’d told her bikini shots, as swimwear isn’t something we’d done yet. I spent my afternoon searching for spots. The field I used to shoot in a lot is extremely overgrown, the quarry said no, and the lake sunset spot I usually shoot is about 3’ deep right off shore due to the lake being so full. I was getting worried near time we were supposed to start shooting, but I kept looking. Just when we were about to give up, I pulled down into lower pool park at the dam and told her this was the spot. She rolled up about 7:30pm and we went down the path towards where I’d scouted. We made it about 10’ down the path when I noticed the fog on the water. Immediately I told her we needed to go elsewhere, so we got in my car, and rode to the other parking lot for lower pool and started shooting. We started partially in the water which coming directly from the bottom of the lake is extremely cold. Her face was priceless! We moved on to shooting a couple on the bridge, but there was a lot of foot traffic at 7:30 on a Friday night, so we moved down to the rock below. The river was flowing high, so people weren’t down there fishing. She slipped on the bathing suit cover, and slipped off her bikini for some sexier shots. No sooner than I had her bikini in my pocket, a family walked by. #awkward Nothing was showing, so no biggy, she just felt a little more naked than she’d like to with people around. They left after a few minutes, and we got the shots we were going for, then moved on to the wooden bridge. We shot a few cool shots here, then noticed the pink sunset had painted the fog. 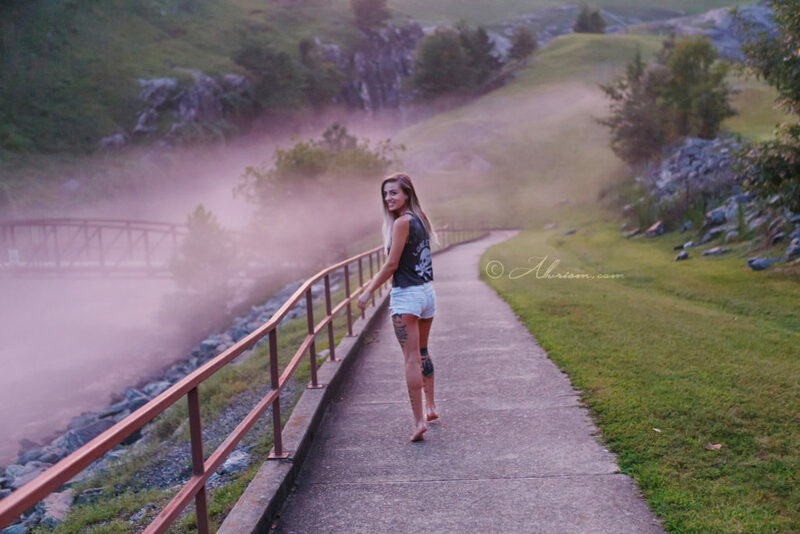 We hurried back to the metal bridge and shot some more with the pink and blue cotton candy fog.